How would you like it if you’d have a great idea that could change the whole world, the way every human being thinks, and as you let people know about it they’re enthusiastic, amazed, they support you 100%, but as more and more people get to know it in just a short while the excitement is gone and your ideas dies as quickly as it rose to attention? The Apollo Lunar program took men to the furthest place they’ve gone to until the present time. A great achievement in such a short time that has had a lasting legacy in some ways. The space race between the Soviet Union and the United States was the main reason why Apollo program started when it did, and it’s important to remember that it was during the Cold War era, that such activities were undertaken. Apollo 11, that took the first men to the surface of the moon was televised live, it generated a lot of interest in media, and more than 3000 journalists covered the story, space walks were on TV live on prime time – the race had been won. Interestingly enough there had been several astronaut’s who had opposed the idea of having TV cameras onboard the spacecraft that would stream the live image, as it would take up too much of mission time. These cameras lead the way to a story with a somewhat sad ending, as right after the Apollo 11, on Apollo 12 the live broadcast lasted only for an hour because of technical reasons, although the previous one had hours on air. This book is a very interesting read, as you can feel how the public loses interest in the lunar missions, and it’s ultimately sad. The book almost made me cry and made me feel somewhat like I did when I was a teenager reading about the great expeditions to Antarctica – the whole world had been mapped, and something seemed to have ended. With the Moon however it seems to have ended before it even got to begin, just because it was ahead of its time. The story is interesting, as you can find out about how some journalists had to deal with economic difficulties but still were able to cover the Apollo missions, or how some of the astronauts were caught trying to earn money from tax-payer funded missions, about how the Columbia command module travelled around the US and why did the world Expo in Japan get so many visitors especially in the American expo. Also find out about where did many of the lunar rocks end up. 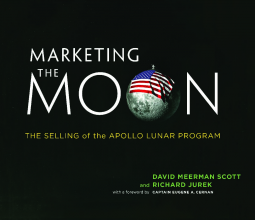 This entry was posted in Non-fiction, Uncategorized and tagged Apollo missions, astronauts, book review, David M. Scott, Marketing the Moon, Moon, NASA, Richard Jurek. Bookmark the permalink. I would love to have read of this! If it were more like $10 than $30 I would probably be ordering it now. Kadri – thanks for the wonderful review: glad you liked it! David — I know what you are saying, but if you could see the physical, hardcopy book. It has over 300+ illustrations, many of which never published before…it is also oversized, more like a coffee-table sized book. Meant to be more of a museum exhibit in your hands than just a book, thus the price. As authors, we don’t set the price – it is just a function of the process. But please do ask your library or other similar institution order it — that way, you can read it. Just a thought. Thank you both! I appreciate your comments.